Blood Water Paint by Joy McCullough published in 2018. This was the first book that Goodreads recommended to me. So hey, thanks to Goodreads for the good read. This is also the first book I’ve read that is based on a real person, this individual specifically being Artemisia Gentileschi, a young female painter in early 1600’s Rome. Currently she is considered one of best Baroque artists of her time, yet of course, due to her being a woman, this was not the case when she was alive. The reader follows Artemisia struggle at the hands of her father putting his name on her work, but her situation becomes ever direr when Agostino Tassi enters her life and rapes her in her own studio. She is then faced with a difficult decision; keep her head down and avoid stirring up trouble or fight for justice. She keeps the memory of her late mother alive by reminiscing about the stories she told her as a child of strong biblical women, specifically Susanna and Judith. These women are metaphorically by her side throughout the entire trial. Written entirely in verse, Blood Water Paint is an intense look into early feminism, Baroque art, and tales of powerful women. This novel was much more unique than I thought it would be. I’ve honestly never read anything like this, and I mean that in a good way. Like I mentioned above, this was written mainly in verse. It’s very abstract and outlandish at some moments, to the point where some parts might be demanding for the average reader to grasp. Normally I can read while listening to music, but I had to put every ounce of attention into McCullough’s words. This is not a damning quality though, because if you do intensely focus on the words, they are that much more impactful and it leads to an overall a clear story to follow. The whole choice of writing in verse was very intriguing—perhaps a poetic writing style for a tragically poetic life? The only parts that were not in verse were the stories of Susanna and Judith. Both originated from the biblical tales and were popular inspiration for painters at the time. In the case of Artemisia, they were stories told to her by her mother as a small girl, and models of how forceful females looked. I particularly liked how McCullough wrote it as if Artemisia’s mother was personally telling us these stories. It created a very cozy and intimate atmosphere in what was a very cold and uncomfortable plot. This is such a powerful statement that so many people can easily relate too. It’s such a creative way to express how devastated by losing a loved one, and it left such a hole in my heart. Now I must talk about one of the main themes that were ever so clearly discussed in this book—feminism. It was interesting witnessing the early 17th century from the point of view of a woman, particularly a female artist. We saw how many aspects of her life were oppressed, such as being expected to take care of all the men, not receive credit for her work, and most compelling is how the different perspectives affected their art. Simply put, men cannot portray women (strong women to be exact) accurately in their artworks. They can’t seem to wrap their minds around the fact that woman can be less than delicate perfect figures there to bring pleasure to their eyes and other parts. The idea that women can get messy and violent and basically have essential emotions does not occur to them. Yet this occurred to Artemisia, because she lived it, alongside millions of other girls before, during, and after her lifetime. Let’s compare three different artists work on a similar subject; Judith Beheading Holofernes, a topic thoroughly mentioned in the novel. First, we have Orazio Gentileschi’s (Artemisia’s father) piece. It shows both women with somewhat distressed looks on their face, holding a perfectly amputated head in a basket. 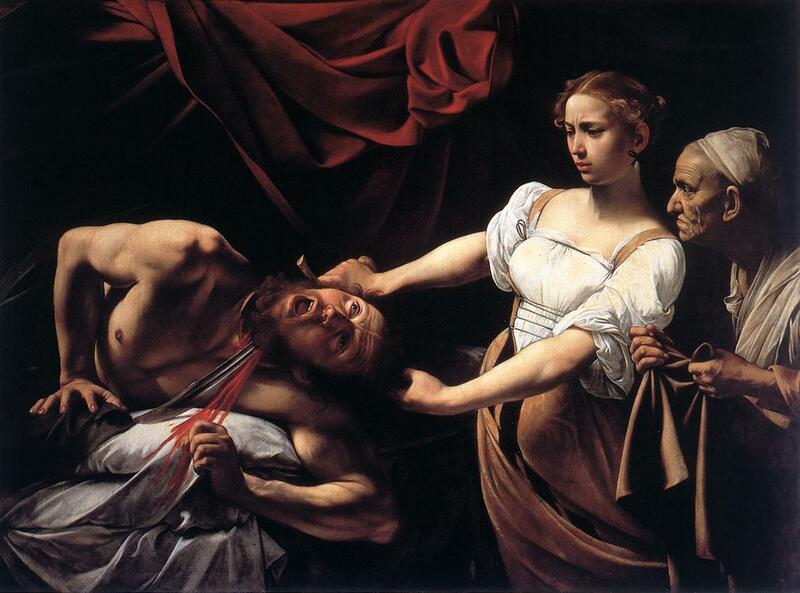 Then, Caravaggio’s piece, showing the action to be a bit more violent. Yet finally, there is Artemisia’s piece, which sketches both Judith and her handmaiden joining the act of violence, clearly fighting back a large, powerful man. Because if there’s anything that frightens a man more than a strong woman taking down a powerful man, it’s two strong women. The portrait also has considerable more blood, the image of a woman that men are so afraid of—crudeness. I’ve never looked at art like this, and I’m honestly probably going to be affected by this every time I enter an art gallery from now on. I think this is a book every young woman should read, to become more assured of themselves as woman and understand that their place in this world is bigger than they may have imagined. It’s also very educational and inspired me to do my own research on Baroque art. It’s altogether empowering yet crushing at the same time. It makes one realize that women are indeed capable of breaking the glass ceiling, though even though own current society has made many strides for gender equality, the glass is simply cracked at the moment, not broken.